On an Autumn day in 1925, with yet another football season about to begin, F.I. (Dolly) Grey, Senior Mathematics and Sports Master at Prince Alfred College was pondering on the future of the boys about to leave school. He was one of the quietest of men, exuding humility, manners impeccable and a quality of understanding the problems of those less fortunate than himself. Academically the most highly qualified member of staff. In addition to a Master of Arts degree, for a schoolmaster, he possessed a second and unusual qualification, that of a Master of Engineering. From this Great Man was borne The P.A.O.C. Football Club. As a part of the Prince Alfred College (PAC) (est. 1869) community, the Prince Alfred Old Collegians Association (PAOCA) is one of the strongest Associations of its type in the Southern Hemisphere. The School is located at Dequeteville Terrace, Kent Town, Adelaide, South Australia on the eastern fringe of the parklands that surround the city. The PAOCA has many other sporting Clubs including Badminton, Basketball, Cricket, Hockey, Soccer and Squash. PAC has also produced some outstanding footballers. VFL/AFL players – Rick Davies, Craig Kelly, Rodney Maynard, Doug Smart, David Pittman, the Russell brothers (Kym and Scott), Bernie Vince, Ed Lower, Nic Lower and Jack Trengove. In addition, the School has had numerous others that have gone onto represent the State in the SANFL. 1928 Upon the establishment of a second grade, the Club requested to go into A2 to be able to compete with old rivals, SPOC who had just entered a team. 1932 The Club entered a second team. 1934 A’s went back into A1. 1937 The A’s lost the A1 Challenge Final by 3 points. 1946 Club’s first premiership in A2 defeating Goodwood by 14 points. 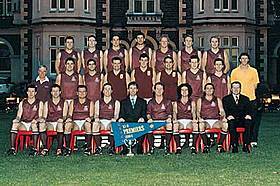 1958 The Club entered a third team and the A’s defeated SPOC in the A2 grand final. 1959 Park 15 (opposite the School) was used for the first time and the clubrooms were built. 1960 PAOC had two games televised on TV. 1962 The Club entered a fourth team. First interstate match against Wesley Old Collegians in Melbourne. Flood lights erected at Park 15. 1967 Club fielded teams in A1, A1 Reserve, A3 and A3 Reserve, the highest grades for all four teams. 1972 16th March the “245” is opened at 245 The Parade, Beulah Park. Dual A & B premierships in A3 & A3 Reserve. 1976 Fourth team is withdrawn. 1978 B Grade wins its third premiership in a row. 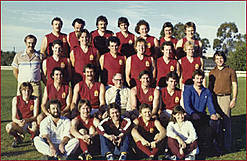 1982 B Grade plays in its eighth Grand Final in a row, losing to Adelaide College by 7 points. 1983 Fourth team returns to competition. 1984 D Grade wins its first premiership in A6 Reserve. 1991 Club moves its playing base to Park 9. 1996 Fourth side is withdrawn again. 1997 The “245” is sold and the Club sets up its social base, upstairs at the General Havelock Hotel. 2002 3rd May PAOC defeat SPOC to win the inaugural “Coopers & Yalumba Intercollegiate Cup” played under lights at Norwood Oval by 1 point. 2004 A’s win D3 premiership at Alberton Oval over SMOSH West Lakes. First A Grade premiership in 24 years. 2008 After 11 years at the Havy, the Club moves its social base to the Hackney Hotel. C Grade wins its first premiership in Division C4. 2009 Club moves its social base to the Alma Tavern, signing up Crows legends Mark Ricciuto & Tony Modra to play. Club wins all three premierships for the first time. 2010 Fourth side added again. 2011 C Grade becomes the first side to win four premierships in a row. 2013 Club moves its social base back to the Hackney Hotel. 2016 The Club enters a fifth team. The Club wins its first ever Division 1 Premiership in its 90th Year Celebration. Today our season commences in March/April and the finals are in September/October, if you would like to play in a friendly competition please get in touch, we can accommodate all ages and abilities. The Club’s home oval is at “Princes Park” (Park 9), located off Bundeys Road, North Adelaide and we practice on the oval on Tuesday, Wednesday and Thursday evenings, starting around 6:00 p.m. Post match festivities are held in the Front Bar at the Hackney Hotel, 95 Hackney Road, Hackney. The Club has 4 teams in Division 1, Division 1 Reserve, Division C1 and Division C5.